As a professional musician, Randall Marsh estimates he has played with thousands of bands. The son of a Bushnell, Fla., politician, Marsh plays guitar, but his first love was drums. "In my hometown, the high school was on the other side of the road from the elementary school and the marching band would be out there practicing," said Marsh. "The sound of the snare drum was the coolest thing I'd ever heard." Marsh joined the school band to get access to drums and took to them naturally. "But the band teacher would say to me, 'This is not a rock band, Mr. Marsh.'" He played with local groups and, after high school, Marsh ended up in the progressive city of Gainesville. An ad in a music store led him to meet guitarist Mike Campbell. They played together for about a year before the bass player quit. "Tom Petty's band had just lost some players and I got an audition. After my first rehearsal, I heard them talking about needing a guitarist. I said, 'I know a guitarist.' Mike came in and just blew everybody away." That band was called Mudcrutch. "They were more country rock and we were more psychedelic and we just sort of merged into this new hybrid thing and basically did that for four to five years." After recording one 1974 single, the band broke up. Petty, Campbell and keyboardist Benmont Tench were later to reconnect as Tom Petty and the Heartbreakers. "I kept trying to find bands. I delivered flowers, washed dishes, worked at restaurants, played in cover bands and got a few gigs," said Marsh, "but by '86, I was just tired of L.A."
About this time, Marsh and friends came to Ojai to hear Krishnamurti speak. "We walked around Ojai and I was just blown away. It was so nice and calm and peaceful." 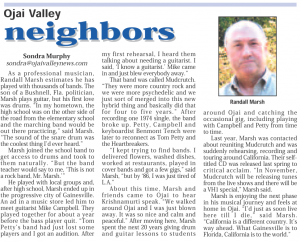 After moving here, Marsh spent the next 20 years giving drum and guitar lessons to students around Ojai and catching the occasional gig, including playing with Campbell and Petty from time to time. Last year, Marsh was contacted about reuniting Mudcurtch and was suddenly rehearsing, recording and touring around California. Their self-titled CD was released last spring to critical acclaim. "In November, Mudcrutch will be releasing tunes from the live shows and there will be a VH1 special," Marsh said. 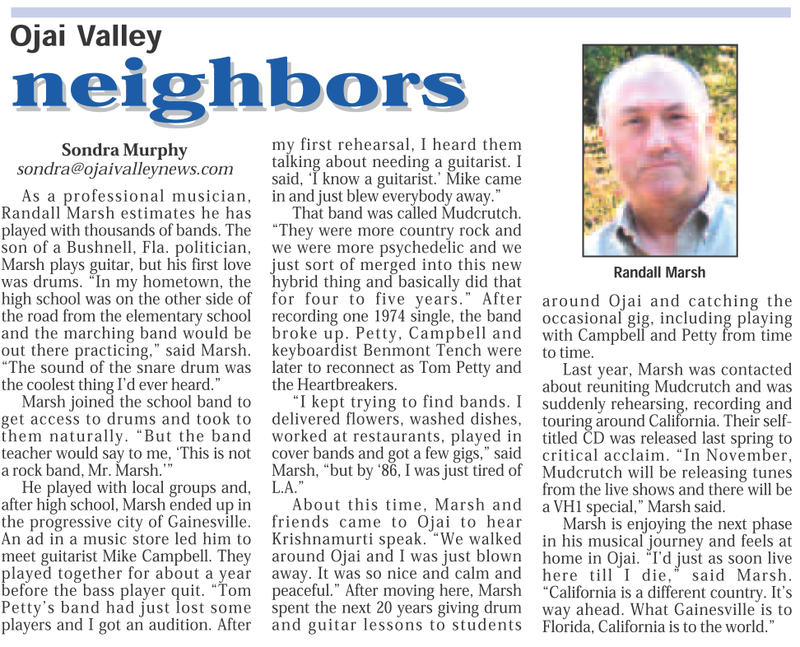 Marsh is enjoying the next phase in his musical journey and feels at home in Ojai. "I'd just as soon live here till I die," said Marsh. "California is a different country. It's way ahead. What Gainesville is to Florida, California is to the world."